Between 2008 and 2010, Jebo Samuels completed his apprenticeship as a real estate agent (CIC) with the renowned real estate consultants Grossmann & Berger in Hamburg. Following this, Samuels started his 6 years of self-employment, during which he gained extensive experience of the residential real estate sector. By renting and selling apartments and houses he acquired his extensive knowledge of the Berlin housing market. In 2017, he was jointly responsible for the sale and leasing of hotel properties in Northern and Eastern Germany at Christie & Co., one of Europe’s leading hotel property consultants. 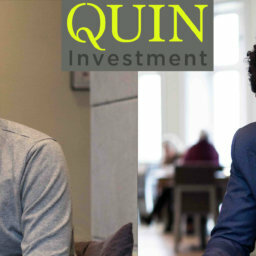 As managing partner of QUIN Real Estate Investment GmbH, he is responsible for the setting-up of the company, the sale and leasing of hotel properties and the expansion of the company network. Jebo Samuels has held the title of Real Estate Economist (IRE|BS) since the summer of 2017. After Stephan Brüning’s apprenticeship as a real estate agent (CIC) between 2009 and 2011 with one of Europe’s leading commercial real estate consultants, BNP Paribas Real Estate, he moved to Savills, another international real estate consultant. Here, Brüning was responsible for the letting of office space for approximately 2.5 years, as a result of which he built up a diverse network and gained extensive knowledge of the Berlin office and commercial market. From the end of 2013, Stephan Brüning worked for 4 years for Christie & Co., one of the leading European hotel property consultants. Here he was responsible for various transactions (sales/leasing) of hotel properties in Northern and Eastern Germany. 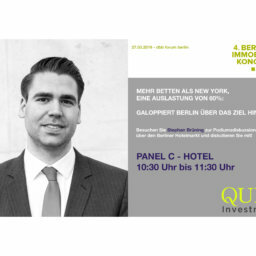 Like Samuels, Brüning is a managing partner of QUIN Real Estate Investment GmbH in the field of hotel sales, leasing and corporate and network development. 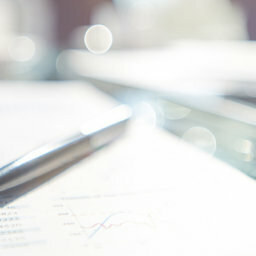 With QUIN Investment we have set out to offer professional services with absolute transparency and clarity. Read more about our philosophy and mission.